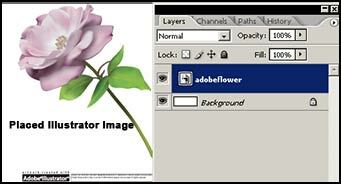 Adobe Photoshop CS2 has been considered the premier image editing program for many years now. Now it works closer than ever with Illustrator CS2 to blur the lines between raster and vector images. Adobe Photoshop CS2 can be purchased as a single product or as part of the Create Suite 2. As a single product, a full version retails for US $599.00 and can be either downloaded or purchased as a CD-ROM. 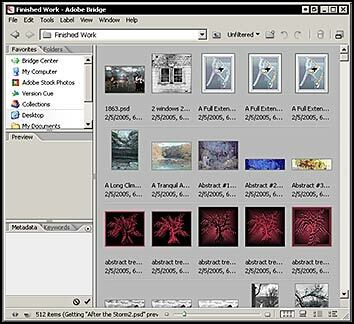 If one chooses to upgrade from an earlier version of Photoshop, the cost is US $149.00. One also has the option of upgrading from some of the other Adobe products such as Photoshop Elements, Photoshop LE, or PhotoDeluxe. The cost, then, is US $499.00. For an over view of some of the new features in Photoshop CS2 as well as those features common to CS2, see the review of Creative Suite 2 . This review will mainly deal with the new features of Photoshop CS2. An important aspect of CS2, as well as of the other individual programs that comprise CS2, is the Bridge. When I wanted to find a photo to use, I accessed the shell toward the right on my tool bar. I found I used the Bridge steadily where I did not use the browser much at all in former versions of Photoshop. There are a lot of new features in this new edition of Photoshop. I'll start by discussing those that correct, distort, or enhance an image. This will not include any of the actions pertaining only to digital camera images. Many of these new features have excellent short movies on the Adobe web site describing in detail how to use them. The Vanishing Point is a new filter. You map out a plane (blue lines) and then place an object in it. The object can be cloned, painted or copied and pasted. 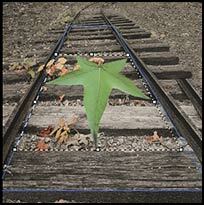 The leaf was copied and pasted in. After it was pasted, I used the transform tool to place it within the framework of the vanishing plane. There are a number of options which accompany this filter such as opacity, feathering, and, when cloning, having the option of simultaneously using the healing brush. Warp is a new command found under Edit>Transform>Warp. Warping can be accomplished manually or through a series of options. However, when I needed to sharpen just the white lettering on a dark background, it worked very well. When I chose to sharpen the highlights only, I could adjust the dials so that I removed the halos around the letters. I could not do this with the Unsharp Mask. Two new tools accessed from the left tool bar are the spot healing brush and the red eye correction tool. The new Optical Lens Correction filter can be found under Filters>Distort and it is basically the reverse of some of the filters in that category. It reverses barreling and pincushioning. 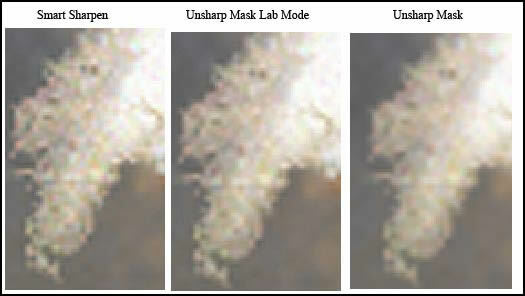 It also gives the added options of correcting vignetting, chromatic aberrations, and much more. This filter can also be used to create some nice effects even if there are no problems with the image. I created distortion as well as vignetting in the image below. 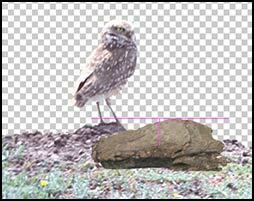 Photoshop CS 2 introduces the ability to create and edit 32-bit High Dynamic Range images by combining shots of the same image where either the shadows or highlights have been clipped. I tried, but the pictures I thought would work did not have enough dynamic range. Increasing the work flow and customization of Photoshop has also been enhanced in this new version. But we cannot forget integration as well. Smart Objects are an important item in that area of streamlining the workflow and increasing integration with other products such as Illustrator CS2. Nondestructive transformations can be performed on Smart Objects while the original object stays as it was. Smart Objects can be exported in a pbs file format for raster data and pdf files format for vector data to be used in other programs. The red arrow points to the icon that shows that the layer is a smart Object. It can always be reopened into its original layers. 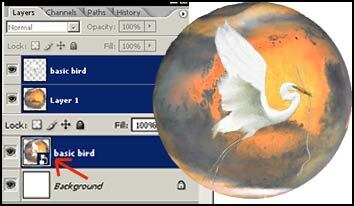 Illustrator images can be placed in a Photoshop document where they are saved as Smart Objects. Photoshop finally has a new font menu. Yes, it is finally a WYSIWYG menu. You can access it from the character palette or the context sensitive options bar. Menus can be customized in Photoshop CS2, event based scripting can be created so that commands occur at certain points in the workflow, and many small unobtrusive changes have been made such as additions to the display and cursor's preferences. 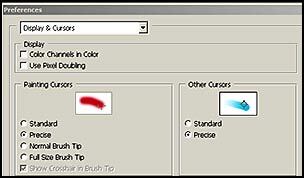 Smart Guides are a new feature of Photoshop CS2. When activated through the View menu, they are automatically turned on when placing a shape, for example. Notice the magenta lines on the rock. They are supposed to help with increasing the speed of editing without having to use the layer's palette. Photoshop CS2 has a special relationship with the Wacom Intuos3 and the Cintiq 21UX digital tablet in conjunction with the new Wacom 6D Art pen. This pen works on the principle of rotation. It adds a new dimension to all of Photoshop CS2's brushes. See the review of the 6D Art pen. And looking toward the future, Photoshop CS 2 is ready to work with over 2 GIGs of memory when it runs on 64-bit processors. All in all, there are a lot of enhancements, improvements, and additions in this new Photoshop upgrade. There are other new features in Photoshop CS2 that I haven't mentioned. I have tried to highlight the major ones. For more information, see New Features on the Adobe web site.